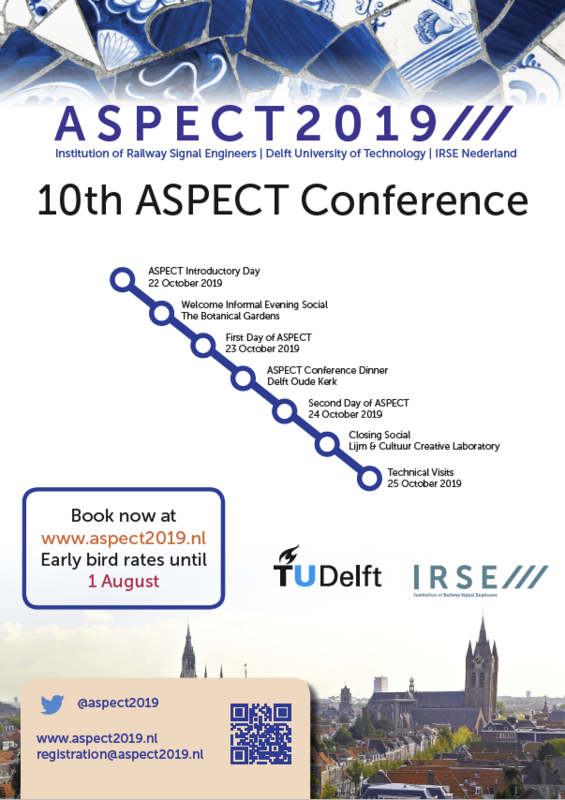 The IRSE Dutch Section has agreed to organise the IRSE's Aspect 2019 conference in cooperation with the IRSE UK and Delft University of Technology, where we will be hosted in its prestigious Aula and auditorium. The venue will be Aula and Conference Centre of Delft University of Technology in the city of Delft in the Netherlands and the tentative dates for the event are in week 43 in 2019. The conference will open on October 22nd with the introductory day and welcome reception, the main conference days on October 23rd and 24th with a selection of Technical Visits being offered on October 25th. Our partner at Delft University of Technology is the Department of Transport & Planning, represented by Prof. Dr. Rob M.P. Goverde, Professor of Railway Traffic Operations & Management. The ASPECT 2019 conference programme is now online. Here, you will find details and useful information on all conference sessions, abstracts, exhibits, and events taking place during APECT2019. ASPECT is the IRSE's flagship international technical Conference, held every 2 years at locations around the world. Featuring thirty or more papers by technical experts from around the world, the Conference provides an unrivaled opportunity for learning and the exchange of knowledge in the fields of train control, railway communications and related disciplines. There is also a day devoted specifically for younger members, and a technical visits day, to accompany the two main "papers" days. In 2019 we’re excited to host the 10th ASPECT in the town of Delft. This will be hosted in the University of Delft, with the main conference on 23-24 October 2019. We are looking forward to welcoming delegates and speakers from countries all over the world from all types of railway – high speed, heavy freight, mixed traffic, metro, light rail and tram. We are an international professional engineering organisation with active sections in Australasia, China, France, Hong Kong, India, Indonesia, Ireland, Japan, Malaysia, Netherlands, North America, Singapore, Southern Africa, Switzerland, Thailand and the UK, working to encourage, develop, inspire and promote all those engaged or interested in railway signalling, control and communications and allied disciplines. To this aim, the sections organise technical meetings, seminars and technical visits around the world. The IRSE is the professional institution for all those engaged in or associated with railway signallingand telecommunications, train control, traffic management and allied professions.For more information about the IRSE, click here.